Fantasy, Futuristic, and Paranormal: Don't You Love the SOUND of the Paranormal? Don't You Love the SOUND of the Paranormal? Well, maybe not like ghostly sounds or banshee screeches…but your words turned into voice. We all have voice, but what if you turned your book into a real voice, one that you can hear? I am the proud producer of a couple of audiobooks. Some of my Highland books were turned into audio, which was lots of fun. I love Scottish dialogue. But I wasn’t involved in the process. This time, I was. With The Dark Fae. And Kiss of the Vampire. Two young adult books. Two different projects and ways of going about it. With The Dark Fae, I found a narrator on ACX. This is owned by Amazon. It was different from Voices, in that once I approved the book, I was ready to sell it. I just need to pay the narrator. I didn’t have to. I could have paid just through royalties, 50/50, but I wanted to pay an hourly rate. And then it was done. But if you don’t want to or can’t afford to invest, then the 50/50 royalty is a good way to go. You have to decide who to distribute it through also. If you want only Amazon to distribute it, then you receive a higher % and they also make it available on Itunes. If you want to make it available to other outlets, you couldn’t do it if you check Amazon only, so if you’re looking for other outlets, it’s better to check the block for that. For The Dark Fae, the check is in the mail, literally, and once the narrator receives it, I can have ACX distribute it. With covers, you can’t use the original cover you would use on your books. Audiobook covers need to be square. So I played around with that until I could create a whole new cover, same look, but square. Of course, I tried the easy way out first, thinking to squish and squash it into the right size. But it would have looked awful. So I had to start from scratch. They won’t allow you to use borders either. All in all, you want the best look, so that’s important! Now, with the other project, Kiss of the Vampire, I went through Voices. Once you have a book narrated there, you have to upload it to someone else to distribute it for sale. If you agree to pay a set price, you have to put that money in escrow right up front. Then when you have finished reviewing the files and agree to them, you can approve it and release the money right then and there. I didn’t care for having to set up the escrow, but in the end, it was easier than having to pay the narrator through ACX since my narrator didn’t want to receive payment through Paypal because she’d lose some of her payment that way. Why even create an audiobook? There are lots of audiobook readers. I love to listen to audiobooks! Especially on trips. It gives your book another outlet. Ebook. Print book. Audiobook. Will you sell a lot? You never know. It’s just like with any title. We never know which will do well. You have the added advantage/disadvantage of adding voice—a narrator’s—to the mix. Some will love the narrator’s voice. But if the majority don’t care for the audiobook version, it can hurt audiobook sales. I remember a friend saying she was buying the author’s book and wouldn’t listen to the audiobook because of the way the story was written and she felt she wouldn’t get as much out of it by listening to it. So it doesn’t mean that an audiobook will hurt book sales. In another case, I tried to get into a book and just could not. So by accident, I picked up the audiobook version and didn’t have anything else to listen to on the way back and forth to work and so I kept listening to it until I reached the end. Good book—to my surprise! What is the next project? Second book in the fae series. And since I’ve already worked with my narrator, we’ve already agreed to terms and she’s delighted to start a new project. And that means more audiobooks in the future. So, ever listen to audiobooks? Do you produce them for your own work? Or have you thought of giving it a shot? 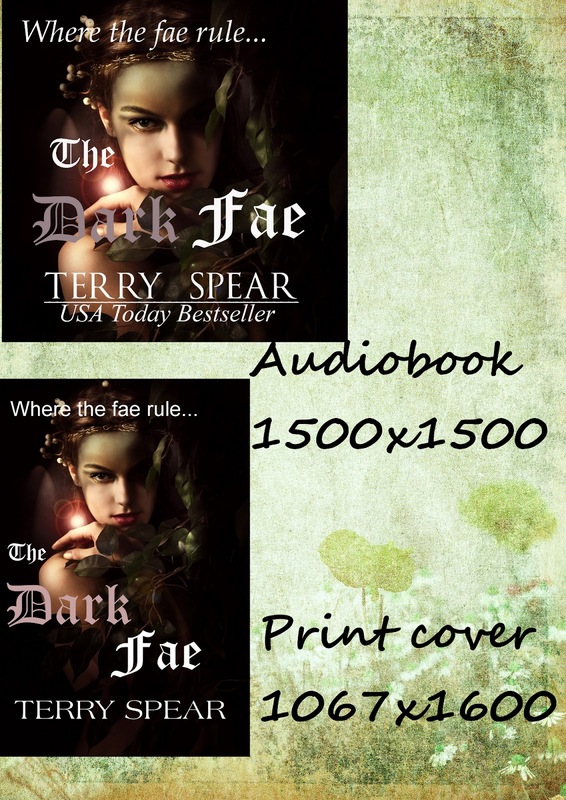 Bestselling and award-winning author Terry Spear has written a couple of dozen paranormal romance novels and two medieval Highland historical romances. Her first werewolf romance, Heart of the Wolf, was named a 2008 Publishers Weekly’s Best Book of the Year, and her subsequent titles have garnered high praise and hit the USA Today bestseller list. A retired officer of the U.S. Army Reserves, Terry lives in Crawford, Texas, where she is working on her next werewolf romance and continuing her new series about shapeshifting jaguars. For more information, please visit www.terryspear.com, or follow her on Twitter, @TerrySpear. She is also on Facebook at http://www.facebook.com/terry.spear . Great post. I usually listen to audio books on long trips. It makes the time go by so much faster. I love the Dark Fae cover. Great post, Terry! I love learning about this. Hopefully I'll get around to putting mine into audiobook. I so agree. I didn't think of that, but yes. It's a way to multitask. I wouldn't find anything decent to watch on tv while I made my teddy bears for orders, so I'd listen to a book. I love it! I am purchasing Photoshop Elements 11 today (on sale at Staples) so I can make my own book covers. I hadn't thought about an audio book! Good to know it is easy to do. Thanks!